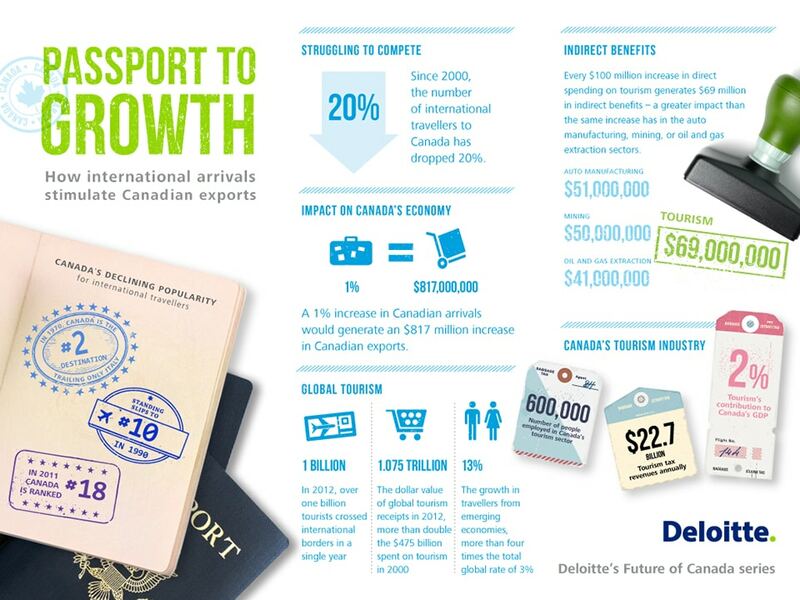 Deloitte’s analysis shows that an increase in international arrivals to Canada spurs exports in the subsequent year. Discover why. You invite your uncle from India to take in an Emily Carr exhibit in Vancouver. He rounds out his two-week visit with a whale-watching trip to Tofino. And when he returns home, he’s got a few good snapshots that accompany even better memories. In fact, it may be that your uncle has not only gained a new appreciation for Canadiana, he’s now keen to stock up on Canadian goods and services. He’s not alone. New research by Deloitte has found strong links between an increase in tourism — whether it’s for business or pleasure — and growth in Canadian exports. In other words, strengthening tourism can have a positive impact on Canadian companies and the economy overall. A recent study of Arizona agribusiness shows that firms that made a business trip to Mexico were up to 51% more likely to trade with counterparts south of the border. Canada was once one of the world’s hottest tourist destinations. Back in the heyday, in the early 70s, Canada was second only to Italy as a destination. Today, Canada has slipped to the 18th spot, trailing countries such as Ukraine and Saudi Arabia. What’s worse? The number of international travelers to Canada has dropped 20% since 2000. The Canadian tourism sector employs over 600,000 people. It generated $22.7 billion in government revenue for 2011. It accounted for 2% of Canada’s 2011 GDP. Oil and gas: $41 million. Deloitte looked to existing research for clues about the link between tourism and exports. Travel and tourism enables the face-to-face meetings that are crucial to overcoming linguistic and cultural barriers. It allows business people to develop the connections and trust necessary for parties to enter into trade relationships. At the same time, travel can build familiarity with a country’s products and help boost foreign demand for these goods. A recent study showed German tourism in Spain helped stimulate demand for Spanish wine in Germany, particularly among lesser known types of wines. Drawing on Canadian data on exports and international arrivals with several academic models for analyzing the impact of tourism and trade, Deloitte undertook its own study of how international arrivals effect Canadian exporters. Our analysis shows that an increase in international arrivals spurs exports in the subsequent year; even a 1% increase in arrivals to Canada will grow Canadian exports by $817 million over the following two years. It also increases the range of goods and services exported. Building on this finding we can see that if Canada’s 2011 international arrivals had grown at the U.S. rate, Canadian export volumes might have risen $4.17 billion. That’s nearly as much as we export to Brazil and Russia combined. If Canada were to regain its former standing as a popular travel destination, the economic benefits to the Canadian economy could be enormous. Deloitte’s previous research into Canadian productivity found that firms which expose themselves to the competitive intensity of the global market become more innovative. They are also more likely to achieve higher growth with better long-term prospects than those that restrict themselves to the domestic market. In other words, investing in Canadian tourism won’t just make the tourism sector stronger; it could also help boost exports, in turn making firms in other sectors more competitive and productive. Clearly, this goes beyond selling more tickets to our galleries and whale-watching tours. It’s about our economic future. These new findings underline the importance of making Canada an accessible and desirable travel destination. Check out our findings in Passport to growth: How international arrivals stimulate Canadian exports. Share it with your colleagues and leave us a comment. Poole, J., (2012). Business Travel as an Input to International Trade. Ryan Brain is a Partner at Deloitte and the Regional Managing Partner in Toronto. He co-authored the report. Victor Lu is a consultant at Monitor Deloitte. He co-authored the report.